Breast lesions classified as lesions of uncertain malignant potential (B3) represent a wide range of non-malignant breast pathologies with a borderline histological spectrum and a variable risk of associated malignancy, which may predispose a patient to an increased risk of developing breast cancer in the future. The post-biopsy management of these lesions has changed in recent years from the previously recommended surgical excision of all lesions to a more conservative approach with vacuum-assisted biopsy (VAB) and imaging follow-up. Therefore, it is very important to find imaging modalities that identify the B3 lesions associated with malignancy thus being able to distinguish patients who need surgery from those for whom imaging follow-up is sufficient. Breast magnetic resonance imaging (MRI) has been evaluated in some studies for this purpose, but to date, no specific imaging features that predict the upgrade of high-risk lesions have been definitively identified. 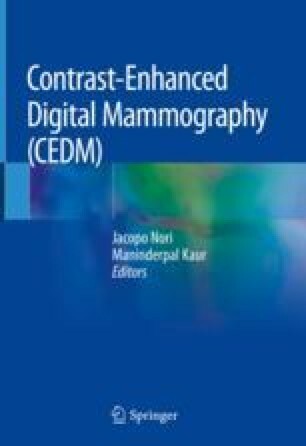 Contrast-enhanced digital mammography (CEDM) demonstrates sensitivity similar to that of MRI with increased specificity for the detection of breast cancer. The increased specificity of CEDM may help predict the malignant potential of breast lesions classified as B3. In this chapter, we review all B3 lesions and describe how they appear by CEDM based on the data available in previous literature and on our own experience. We conclude this chapter by describing our evaluation of the diagnostic performance of CEDM in predicting the malignant potential of B3 lesions.